That puts trust in Japan near the top among nine countries tested in a spring 2012 survey. Nearly eight-in-ten Americans (78%) say they think the U.S. can trust Britain a great deal or a fair amount. About six-in-ten (59%) say the U.S. can trust France and 56% say the same about Israel. 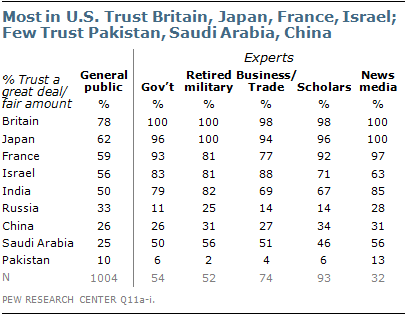 On the other hand, just 10% say the U.S. can trust Pakistan a great deal or a fair amount, while 25% say this about Saudi Arabia and 26% about China.